The purpose of the article is to give you some information on Turtle Tank Setup Guide. As you might already know, turtles need a considerable amount of care and attention. 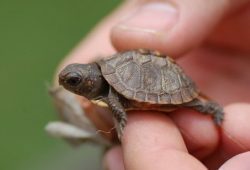 Not only do you have to feed them the right kind of foods, but you also need to provide them with the appropriate turtle aquarium. There are some things to consider when choosing a turtle tank. Good turtle care means preparing a good turtle tank. Realize that a turtle aquarium or tank is not the same is the usual fish bowl. First of all, most turtles grow much bigger than you expect. 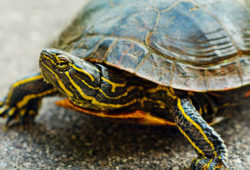 Generally, a 25-50 gallon tank or more is best for a pet turtle. One of the most essential elements of turtle care is getting an appropriately sized turtle aquarium. You can go to a pet store and ask for a “long” or “breeder” turtle tank. Most turtles require both dry land and an area with water. The depth of the water must be more than the length of the turtle. This is so the turtle will be able to easily get in and out of the water. The basking area can comprise simply of large rocks. 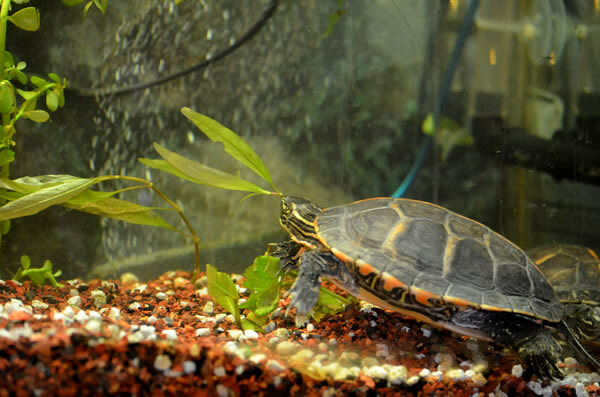 You may put plants in the turtle tank, however, it is best to use small, stout ones instead of the more delicate ones as turtles tend to chew up plants quickly. Plastic plants are permissible in most cases. In reality, many turtles do not require plants, sand or gravel. If you prefer to decorate your turtle tank with these, make sure you clean the tank more often. 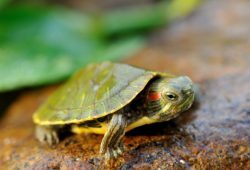 The best way to find out what kind of turtle aquarium your turtle needs is to study the natural habitat of that specific type turtle. There are some accessories that are very important for any turtle aquarium. The larger the stones or more decorations you put in the aquarium, the bigger it will need to be. Important accessories include water heater, heat/light source and filter. Many turtles require that the water be just the right temperature to live long and healthily. A water heater would be good for this purpose. Next, you’ll need to place a heat or light source over the aquarium. This is primarily for basking. You can use heat, UV or fluorescent lamps. Finally, you need to provide a filter to help keep the aquarium clean. Turtles cannot live long if they are always in a filthy environment. In fact turtles can get sick and their shell can rot especially if the water in the tank is dirty. When it’s time to clean the turtle tank, transfer your turtle in another container that is around 75 degrees where it can stay there temporarily. Connect a plastic siphon tube on the water vacuum and lead the other end of the hose towards the tub or sink. As the vacuum gets rid of the water, take away accessories, decorations and other matter from the turtle tank. Clean and brush them well with a toothbrush and white vinegar. Use only water to rinse the filter and brush out any algae. Brush the tank’s surfaces with baking soda and a toothbrush. Utilize white vinegar and a paper towel for the interiors. Once the turtle tank is empty, rinse it all over.